Bourne Cottage01263 715779work01603 870304fax Self-cateringBourne Cottage is a pretty property with an attractive walled and sunny garden. In a popular Norfolk coastal village, located in an Area of Outstanding Natural Beauty, the house is full of character and has plenty of space to unwind and relax in. Close to the beach, cliff top paths and some beautiful heathland, parks, historic houses and more, a stay here is a great spot for accessing this stunning part of Norfolk. Bourne Cottage offers weekly bookings starting on Friday. 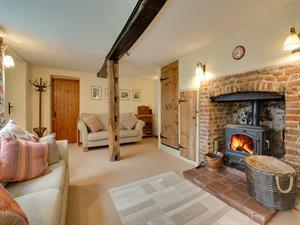 Bourne Cottage is a pretty property with an attractive walled and sunny garden. In a popular Norfolk coastal village, located in an Area of Outstanding Natural Beauty, the house is full of character and has plenty of space to unwind and relax in. Close to the beach, cliff top paths and some beautiful heathland, parks, historic houses and more, a stay here is a great spot for accessing this stunning part of Norfolk.